Background: Obstructive sleep apnea (OSA) is a common disorder characterized by snoring, daytime sleepiness, fatigue, and repeated termination of airflow (apnea). Standard polysomnography (PSG) is diagnostic gold standard for OSA. PSG is expensive and not available everywhere. To identify the best OSA questionnaire for screening in Persian population, we compared Berlin, STOP-BANG, and Epworth Sleepiness Scale (ESS). Methods: In a cross-sectional study conducted on 400 adult patients suspected of OSA in Bamdad Respiratory Research Center, patients completed three questionnaires. For each questionnaire, patients were divided into high risk and low risk. Then, PSG was performed for all patients. According to PSG, patients categorized into without OSA (apnea-hypopnea index [AHI] <5), mild OSA (15> AHI ≥5), moderate OSA (30> AHI ≥15), and severe OSA (AHI ≥30). Based on questionnaires and PSG results, predictive parameters for screening tests were calculated. Results: There were 234 (58.5%) males and 166 (41.5%) females in study population. Mean age of patients was 49.29 ± 9.75 standard deviation years. There was significant association between age with OSA (P = 0.005) and between body mass index (BMI) and neck circumference, with moderate and severe OSA (P < 0.001). Sensitivities of Berlin, STOP-BANG, and ESS were 86.42%, 81.46%, and 59%, respectively. Specificities of Berlin, STOP-BANG, and ESS were 52.94%, 82.35%, and 76.47%, respectively. Conclusions: This study suggested that Berlin and STOP-BANG are more sensitive and accurate than ESS for OSA screening in Iran. Obstructive sleep apnea (OSA) is a common disorder that characterized by snoring, daytime sleepiness, fatigue, repeated termination of airflow (apnea), and hypoxemia. OSA is an independent risk factor for cardiovascular diseases including hypertension, coronary artery disease, stroke, and pulmonary hypertension. The prevalence of disease varies in different countries.,,,, The gold standard diagnostic method is polysomnography (PSG). PSG is a noninvasive technique that involves overnight monitoring of several physiological variables including electroencephalography, eye movements, muscle tone as well as respiratory effort, airflow, and oxygen saturation. An apnea is defined as the complete cessation of airflow for a minimum of 10 s. The definition of a hypopnea includes a reduction of airflow that is associated with either an oxygen desaturation (of at least 3% or 4%) or an arousal. OSA is diagnosed when the apnea–hypopnea index (AHI), i.e. the total number of obstructive apneas and hypopneas per hour of sleep is >5. The severity of OSA is graded according to commonly used clinical criteria as mild (AHI ≥5 but <15), moderate (AHI ≥15 but <30), or severe (AHI ≥30). Considering high cost and inaccessibility of PSG, several screening questionnaires have been developed. The most popular questionnaires are Berlin questionnaire (BQ), STOP-BANG, and Epworth Sleepiness Scale (ESS). These questionnaires had wide range of sensitivity and specificity in different races.,,,,, Hence, we conducted this study to compare the predictive values of these questionnaires in Persian population. This was a cross-sectional study. We enrolled adult patients who visited Sleep Department of Bamdad Respiratory Research Center, for evaluating suspected OSA between May 2015 and June 2016. Inclusion criteria were as follows: age over 18 years, OSA symptoms (fatigue during the day, nocturnal snoring, and observed apnea by others), no previous treatment, completion of questionnaires, and personal consent to do PSG and participate in the study. Patients were excluded if there was a lack of consent to continue and incompletely finished questionnaire and with a history of psychiatric disorder. Ethical Committee of Isfahan University of Medical Sciences approved the study protocol. Informed written consent was obtained from all patients before inclusion in this study. All patients filled out STOP-BANG, Berlin, and ESS questionnaires. Then, we performed standard attended overnight PSG by PSG device (SOMNOmedics GmbH, Randersacker, Germany). In standard PSG, electroencephalogram, electrocardiogram, eletrooculogram, chin electromyogram, oronasal airflow, oxygen saturation by pulse oximetry, thoracic, abdominal, and leg movements were recorded. Scoring was done according to the American Association of Sleep Medicine guideline 2015. Patients were classified based on the AHI values without OSA (AHI <5), mild OSA (5≤ AHI <15), moderate OSA (15≤ AHI <30), and severe OSA (AHI ≥30). Those who performed PSG were not aware of results of questionnaires. PSGs were interpreted without awareness of medical histories and questionnaires results. SPSS version 17.0 (SPSS Science, Apache Software Foundation, Chicago, IL, USA) was used. Sensitivity, specificity, positive predictive values (PPV), negative predictive values (NPV), and positive and negative likelihood ratio (LR + and LR−) were calculated using K 2. The Spearman's correlation coefficient was used for three questionnaires in patients. Tests were two-tailed and P < 0.05 was accepted as statistically significant. We evaluated discriminative ability of questionnaires with receiver operating characteristic (ROC) curves. From May 2015 to June 2016, we included 400 patients in our study. There were 234 (58.5%) males and 166 (41.5%) females and mean age was 49.29 ± 9.75 years. Demographic data for quantitative and qualitative parameters were presented in [Table 1]. There was significant association between age with OSA (P = 0.005) and between BMI and neck circumference, with moderate and severe OSA (P< 0.001). There was no significant association between genders with OSA. Results of three questionnaires were presented as low risk and high risk in [Table 2]. In PSG, frequencies of without OSA, mild OSA, moderate OSA, and severe OSA were 17 (4.25%), 56 (14%), 84 (21%), and 243 (60.75%), respectively. The BQ had the best sensitivity (86.42), but STOP-BANG had the best specificity (82.35%). Predictive parameters of questionnaires including sensitivity, specificity, PPV, NPV, and LR + and LR were presented in [Table 3]. Area under the ROC curve (95% confidence interval) for OSA (AHI ≥ 5) in Berlin, STOP-BANG, and ESS questionnaires was 0.76 (0.69, 0.08), 0.89 (0.82, 0.96), and 0.69 (0.58, 0.81), respectively. ROC curves for three questionnaires were illustrated in [Figure 1]. The Spearman's correlation coefficient between STOP-BANG and ESS, STOP-BANG and Berlin, and Berlin and ESS were 0.20, 0.44, and 0.29, respectively (P< 0.001). When evaluating the predictive values of Berlin, STOP-BANG and ESS to identify patients at risk for OSA, Berlin had the highest sensitivity, but STOP-BANG had the highest specificity, area under the curve (AUC), and PPV. Sensitivity and specificity of ESS were between the others. The sensitivity of ESS was especially low. In the study of Pataka et al., ESS, Berlin, STOP, STOP-BANG, and 4-V were evaluated in the general population. 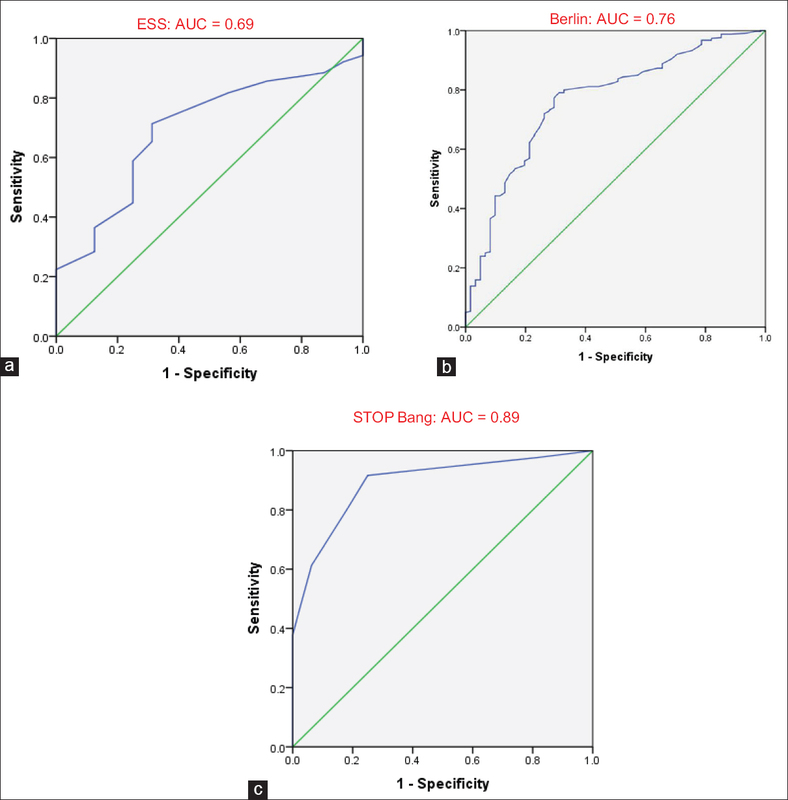 The STOP-BANG had the highest sensitivity, NPV, and AUC, but the least specificity. 4-V had the highest specificity. In that study, sensitivity of STOP-BANG and Berlin was 96.2% and 84.4%, respectively. Both tests had low specificity. The sensitivity of Berlin was similar to our study. The low specificity seems to be caused by difference of populations under the study. Their sample was representative of general population. In a systematic review performed by Abrishami et al., Berlin was the second and STOP-BANG was the third most sensitive questionnaire after Wisconsin in people without a history of sleep disorders. They concluded that STOP-BANG had high quality methodological and reasonably accurate results. Similar to our study, sensitivity of Berlin was more than STOP-BANG. Du et al. assessed predictive value of Berlin, STOP, STOP-BANG, and ESS. STOP-BANG had the highest sensitivity, but Berlin had the highest AUC. AUC for Berlin was similar to our study. In multiple studies, different predictive parameters were reported for OSA screening questionnaires. Discrepancies were caused by different sampling (community vs. sleep clinic), sample size, sample characteristics (gender, age, BMI, and culture), and AHI cutoff (mild vs. moderate to severe). We tried to identify the best questionnaire for screening OSA in Persian population. Patients were referred to sleep clinic due to symptoms. We did not perform the study in general population regardless of symptoms. Although we did not exclude patients with comorbidities to simulate general population, our population was not an exact sample of general population. Patients without OSA (AHI <5) were few. This preselected status of population probably affected our findings. Furthermore, all patients completed Berlin first and ESS last. Because of the effect of time on accuracy of answers, this fixed sequence could be a confounding factor. Therefore, we recommend the future study on Persian population with sampling of community and random sequences for answering to questionnaires. Accuracy of answers decreases with increasing questionnaires probably. Therefore, it is necessary to use valid questionnaires such as Berlin and STOP-BANG in one session. There is a need for highly sensitive and accurate tests for screening and avoiding misses. Considering this, our study showed that BQ and STOP-Bang are more reliable and preferable than ESS for screening of OSA in Persian population. Amra B, Farajzadegan Z, Golshan M, Fietze I, Penzel T. Prevalence of sleep apnea-related symptoms in a Persian population. Sleep Breath 2011;15:425-9. Amra B, Nouranian E, Golshan M, Fietze I, Penzel T. Validation of the persian version of berlin sleep questionnaire for diagnosing obstructive sleep apnea. Int J Prev Med 2013;4:334-9. Kim J, In K, Kim J, You S, Kang K, Shim J, et al. Prevalence of sleep-disordered breathing in middle-aged Korean men and women. Am J Respir Crit Care Med 2004;170:1108-13. Peppard PE, Young T, Barnet JH, Palta M, Hagen EW, Hla KM. Increased prevalence of sleep-disordered breathing in adults. Am J Epidemiol 2013;177:1006-14. Udwadia ZF, Doshi AV, Lonkar SG, Singh CI. Prevalence of sleep-disordered breathing and sleep apnea in middle-aged urban Indian men. Am J Respir Crit Care Med 2004;169:168-73. Pamidi S, Aronsohn RS, Tasali E. Obstructive sleep apnea: Role in the risk and severity of diabetes. Best Pract Res Clin Endocrinol Metab 2010;24:703-15. Chiu HY, Chen PY, Chuang LP, Chen NH, Tu YK, Hsieh YJ, et al. Diagnostic accuracy of the Berlin questionnaire, STOP-BANG, STOP, and Epworth sleepiness scale in detecting obstructive sleep apnea: A bivariate meta-analysis. Sleep Med Rev 2016. pii: S1087-079230127-7. Khaledi-Paveh B, Khazaie H, Nasouri M, Ghadami MR, Tahmasian M. Evaluation of berlin questionnaire validity for sleep apnea risk in sleep clinic populations. Basic Clin Neurosci 2016;7:43-8. Nagappa M, Liao P, Wong J, Auckley D, Ramachandran SK, Memtsoudis S, et al. Validation of the STOP-bang questionnaire as a screening tool for obstructive sleep apnea among different populations: A systematic review and meta-analysis. PLoS One 2015;10:e0143697. Nagappa M, Wong J, Singh M, Wong DT, Chung F. An update on the various practical applications of the STOP-Bang questionnaire in anesthesia, surgery, and perioperative medicine. Curr Opin Anaesthesiol 2017;30:118-25. Netzer NC, Stoohs RA, Netzer CM, Clark K, Strohl KP. Using the Berlin questionnaire to identify patients at risk for the sleep apnea syndrome. Ann Intern Med 1999;131:485-91. Sharma A, Molano J, Moseley BD. The STOP-BANG questionnaire improves the detection of epilepsy patients at risk for obstructive sleep apnea. Epilepsy Res 2017;129:37-40. Chung F, Yegneswaran B, Liao P, Chung SA, Vairavanathan S, Islam S, et al. STOP questionnaire: A tool to screen patients for obstructive sleep apnea. Anesthesiology 2008;108:812-21. Johns MW. A new method for measuring daytime sleepiness: The Epworth sleepiness scale. Sleep 1991;14:540-5. Sadeghniiat Haghighi K, Montazeri A, Khajeh Mehrizi A, Aminian O, Rahimi Golkhandan A, Saraei M, et al. The Epworth Sleepiness Scale: Translation and validation study of the Iranian version. Sleep Breath 2013;17:419-26. Sadeghniiat-Haghighi K, Montazeri A, Khajeh-Mehrizi A, Ghajarzadeh M, Alemohammad ZB, Aminian O, et al. The STOP-BANG questionnaire: Reliability and validity of the Persian version in sleep clinic population. Qual Life Res 2015;24:2025-30. Berry RB, Gamaldo CE, Harding SM, Brooks R, Lloyd RM, Vaughn BV, et al. AASM Scoring Manual Version 2.2 Updates: New Chapters for Scoring Infant Sleep Staging and Home Sleep Apnea Testing. J Clin Sleep Med 2015;11:1253-4. Pataka A, Daskalopoulou E, Kalamaras G, Fekete Passa K, Argyropoulou P. Evaluation of five different questionnaires for assessing sleep apnea syndrome in a sleep clinic. Sleep Med 2014;15:776-81. Abrishami A, Khajehdehi A, Chung F. A systematic review of screening questionnaires for obstructive sleep apnea. Can J Anaesth 2010;57:423-38. Du L, Li Z, Tang X. Application value of four different questionnaires in the screening of patients with obstructive sleep apnea. Zhonghua Yi Xue Za Zhi 2015;95:3407-10. Kim B, Lee EM, Chung YS, Kim WS, Lee SA. The utility of three screening questionnaires for obstructive sleep apnea in a sleep clinic setting. Yonsei Med J 2015;56:684-90. Tan A, Yin JD, Tan LW, van Dam RM, Cheung YY, et al. Using the berlin questionnaire to predict obstructive sleep apnea in the general population. J Clin Sleep Med 2017;13:427-32. Tan A, Yin JD, Tan LW, van Dam RM, Cheung YY, Lee CH. Predicting obstructive sleep apnea using the STOP-Bang questionnaire in the general population. Sleep Med 2016;27-28:66-71.